Above: George is wearing the ‘shako’ cap which is worn with the scarlet coat for all other events. Two types of uniform are issued, known fondly as ‘scarlets’ and ‘blues’ and for normal day wear George will wear his dark blue uniform. Amble war veteran George Skipper has been selected to be a Chelsea Pensioner and is now resident at the Royal Chelsea Hospital in the heart of London. George grew up in Bermondsey and after the death of his first wife, he moved to Amble, where he became a loyal supporter and latterly President of the Amble and Warkworth branch of the Royal British Legion. During WW2, George served in the Royal Army Service Corps and took part in the D-Day landings and last year was awarded the Legion D’Honneur by the French government. In recent months, George moved away from Amble, to live with his son and has now returned to his roots in London to take his place alongside over 300 other army veterans in the Royal Hospital. Harry McQuillen who knew George for many years received a letter from the 94 year old Chelsea Pensioner. “He assures us that he’s happy and well looked after. There’s good company, good food, a very nice room and very good care. Posh hotels for tea, and the prospect of a visit to Biggin Hill for the Remembrance Day parade are a clear indicator of George’s approval of his new life. He mentions the fact that his new Chelsea home is ‘a bit military’ but he’s still happy with it. Of course he remembers Amble with great affection and I’m sure that Amble liked him,” said Harry. George took part in the Remembrance Day parade to the Cenotaph in London. Amble veteran Peter Proctor-Cannon also took part in the parade which was broadcast on TV. Afterwards Peter met George for a drink. “He said he missed Amble, but he is so happy down there,” said Peter. 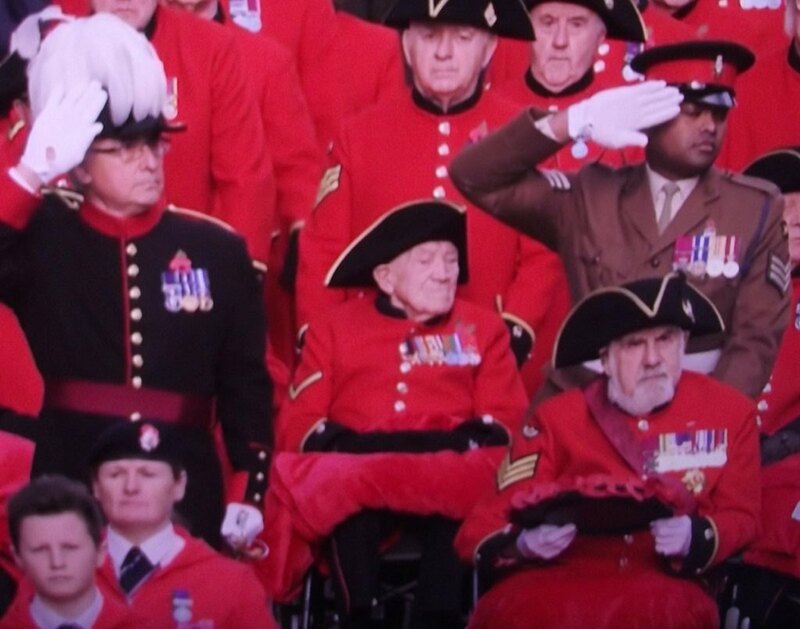 One thought on "George Skipper, proud Chelsea Pensioner"
On Georges left are Two Victoria Cross holders . in Wheel Chair Bill Speakman V.C. Being pushed by Johnson Beharry V.C.